I always get so excited thinking about the first crop of books coming out in a new year…and planning (well, loosely planning) what I’m going to read! This year, I’m doing these quarterly posts a little differently since I now have a podcast! If you missed yesterday’s episode of the Sarah’s Book Shelves Live podcast (listen here), Catherine from Gilmore Guide to Books and I covered 16 books we’re excited about coming out this Spring. I’m talking about 5 of them again in today’s blog post (noted by each book)…but, check out the podcast to hear about the rest! Just click on the time stamp link next to each book and it will take you right to the place in the podcast where we talk about that book. 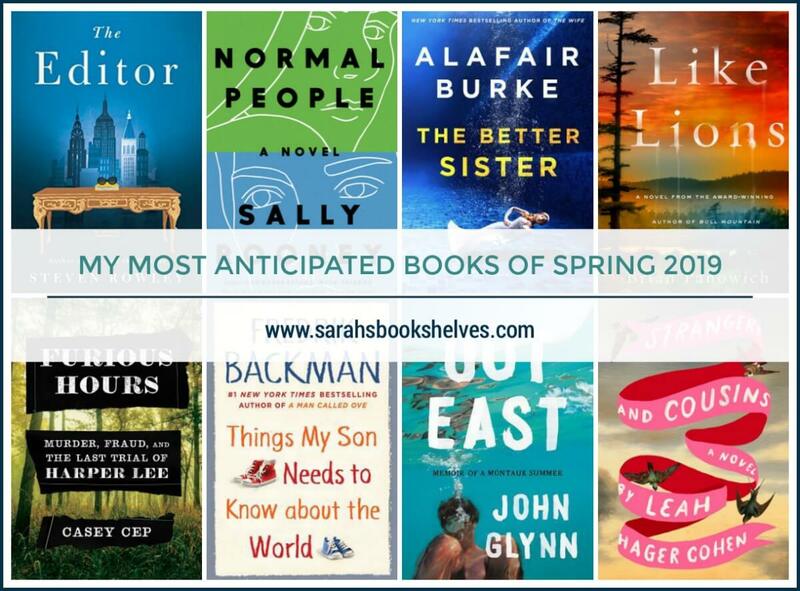 As always, my Most Anticipated Books of Spring 2019 list is mostly made up of books from trusted sources (to find your personal trusted recommendation sources, check out this post and free downloadable template) who, in as many cases as possible, have already read the book. I did not look at a single publisher’s catalog to create this list. I’m sharing the recommendation source for each book and will specify if that source has or has not read it yet. I use my “Rock Your Reading” Tracker (available for purchase for $14.99), to keep an ongoing eye on my most trusted recommendation sources…and improved my reading success 42% from last year! I’ve already read this one and enjoyed it! It’s a fun, light read that’s a mix of the publishing world and a dysfunctional family novel with a bit of star power sprinkled on top (which some may call cheesy, but I think it worked…solely because Jacqueline Onassis was an editor in real life and situations like this no doubt happened). Recommendation Source(s): Already read by ME (4 stars) and Annie Jones of From the Front Porch podcast (3.5 stars). This book is getting TONS of hype and I just finished it and loved it (4.5 stars)! It’s the story of a confusing relationship amid high school and college social dynamics. I was riveted (could’ve finished it in one sitting if I had a big chunk of time) and it reminded me a bit of White Fur (my review) and Tender (my review). But, this isn’t for everyone – there are no quotations for dialogue and it’s fairly sexually explicit. But, I was rooting hard for Connell and Marianne…both independently and as a couple. Recommendation Source(s): Already read and rated 4.5 stars by ME and 5 stars by Tyler Goodson (manager at Avid Bookshop in Athens, GA), Laura Tremaine (host of 10 Things to Tell You podcast), and Resh from The Book Satchel. Annie Jones of From the Front Porch podcast and Pam Cady (Seattle bookseller) also loved it. I really enjoyed Burke’s last psychological thriller, The Wife. I appreciated that it was a good, straight-up thriller without any outlandish gimmicks. When a prominent Manhattan lawyer is murdered, two estranged sisters—one the dead man’s widow, the other his ex—must set aside mistrust and old resentments . . . but can they escape their past? Anyone remember the Grit Lit thriller Bull Mountain that came out in 2015? Well, I rated it 5 stars (my review) and Like Lions is the sequel! If you’re not familiar with Panowich, his books are similar to Greg Isles who wrote the Natchez Burning series (my review). Clayton Burroughs is sheriff of Bull Mountain and last surviving member of the brutal and blood-steeped Burroughs clan. It’s been a year since a rogue government agent systematically crippled the family’s criminal empire, leaving two of his brothers dead and Clayton broken and haunted by wounds that may never heal. Now Bull Mountain is vulnerable, ripe for predators wanting to re-establish the flow of dope and money through the town. And the death of a boy belonging to a rival clan brings the wolves straight to Clayton’s door. Recommendation Source(s): Trusted author and already read and rated 4 stars by Tara at Running N Reading. I love a good true crime book and add Harper Lee to the story? Yes, please! Plus, it’s been compared to Midnight in the Garden of Good and Evil and the S-Town podcast. I love a good essay collection and I absolutely adored Backman’s Beartown (my review) and Us Against You (my review), so I’m looking forward to his take on fatherhood. This book was described by a Goodreads reviewer as “Joan Didion meets the Real World.” And, based on the synopsis, I’m imagining the Bravo show Summer House if Stephen McGee had actually come out on the show. Out East‘s Goodreads average rating is ridiculously high at 4.71. A gripping, unforgettable portrait of life in a Montauk summer house–a debut memoir of first love, identity and self-discovery among a group of friends who became family. I love a good dysfunctional family novel and bonus points if it involves a wedding. Annie Jones said this one is “deliciously weird, a cross between Unsheltered and Seating Arrangements” (my review). *All book summaries (in block quotes) are from Goodreads (edited for length). 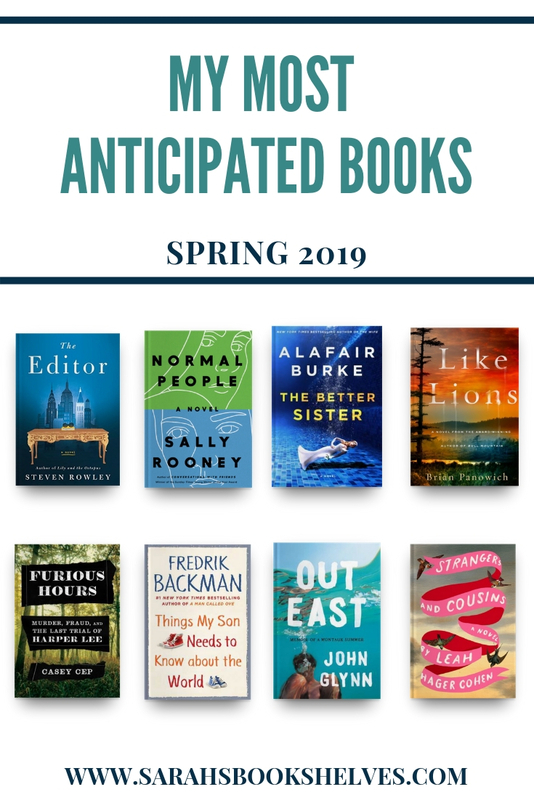 What Spring 2019 books are you looking forward to? A great selection, I’m looking forward to Back and newest too. I’m excited about The Editor. I was a fan of Sally Rooney’s Conversations with Friends and am in a (LONG) library queue for Normal People. Really excited to read it! I’m also loooking forward to The Editor. I had not heard of Furious Hours, but it sounds like something I’d really like … thanks for putting that title on my radar! I feel like I need to drop everything and read Bull Mountain. I’m in desperate need of grab-me-by-throat reading and nothing is working. Which is not great given all the releases in April! Thanks for the shout-out and once again I had a blast recording with you. I’m worried, though, that given my recent success rate I’m going to become a case of what NOT to pick! I’ve got to get my hands on The Editor. It sounds like such a great book! It probably doesn’t surprise you that The Editor is on my list. Ooh, I like the sound of Strangers and Cousins. I read out east this past month because I won it in the goodreads giveaway and LOVED it! Oh good! So glad to hear from someone else who loved it! I’m picking it up soon!